Where can you go on a tour with me? Nowhere official yet. I’m still feeling things out, but once I have something set up, I will let you all know! Training to be a tour guide has inspired me to add another dimension to the “city” part of “City to Trail.” There are a lot of hidden gems in DC. Some of them, like Rock Creek Park, are regularly visited by locals. Others, are just kind of tucked away, waiting for more people to find them and appreciate them. As I continue to expand my knowledge of this city and visit these places, I’ll be sharing the outdoor ones with all of you. First up: Meridian Hill Park. Meridian Hill Park isn’t exactly hidden away. For a lot of residents of Northwest DC, it’s a favorite spot for picnics and outdoor exercise. But if you’ve never seen it before, it’s an exceptional destination all on its own. I remember the first time I saw Meridian Hill Park. I’d already lived in DC for over a year. I’d heard about the park in passing, but I didn’t understand that it was something special. I imagined it was just a small neighborhood park, the kind that you see all over the city. When first I entered the park from Euclid Street, it was exactly what I expected – a flat plain of grassy parkland surrounded on all sides by benches. Then, I walked to the wall located at what I thought was the southern end of the park. When I got to the wall, I leaned over to peer at the other side, and I was stunned. This wasn’t a typical park at all. I was standing at the top of an elaborately designed multi-tiered landscape, and below me was an elaborate cascading fountain surrounded by lush greenery. What was this place and what was it doing in the middle of a major city? 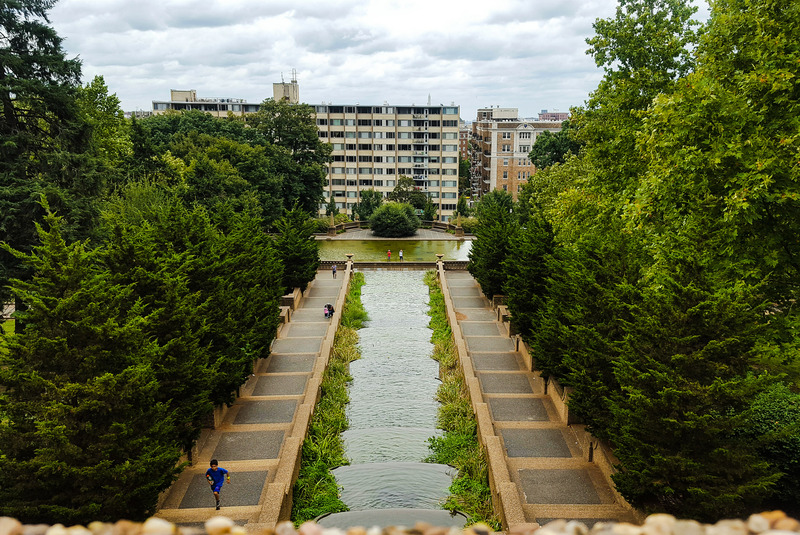 Technically, the 12 acre Meridian Hill Park is an extension of my favorite park in DC, Rock Creek Park, even though the two aren’t connected. Located exactly 1.5 miles north of the White House, the park was once the site of a meridian marker placed by Thomas Jefferson in 1804. Commodore David Porter, who purchased the land in 1816, named his estate Meridian Hill in recognition of this marker. Northwest DC is so developed today that it’s hard to imagine, but at one time there was a view of the White House and the Potomac River from the top of Meridian Hill. Now, if you know where to stand, you can sort of see the top of the Washington Monument peeking out from behind all of the apartment buildings. With its strategic vantage point, the land was selected as the site of a Civil War Army encampment named Camp Cameron. After the war, Porter’s mansion was damaged by a fire and razed. His land was ultimately divided into smaller lots and sold to African Americans. Then came Senator John Brooks Henderson and his wife, Mary Foote Henderson. On 16th Street, across the street from Meridian Hill, the Hendersons built a massive home known as Henderson Castle (this mansion was torn down in 1949). Their mansion wasn’t enough for Foote Henderson. She had a grand vision for the entire 16th Street corridor. She wanted it to be a lavish area, home to embassies and the city’s elite. And the African American neighborhood located across the street? That didn’t fit into her vision. For Meridian Hill, Foote Henderson first proposed building a new presidential mansion. When that failed, she recommended that the property be used for the site of the Lincoln Memorial. Finally, in 1901, the Senate Park Commission (with Mary’s input), decided that the hill should become a park. “As Congress and city officials were won over, no one seemed to care that the site was already densely occupied by African-Americans living in mostly single-story frame houses. Since the Civil War, African Americans had settled in this area, which had been just outside the city limits. The future park site had been subdivided in 1867, and many of its residents owned their own homes. They were all forced to leave. 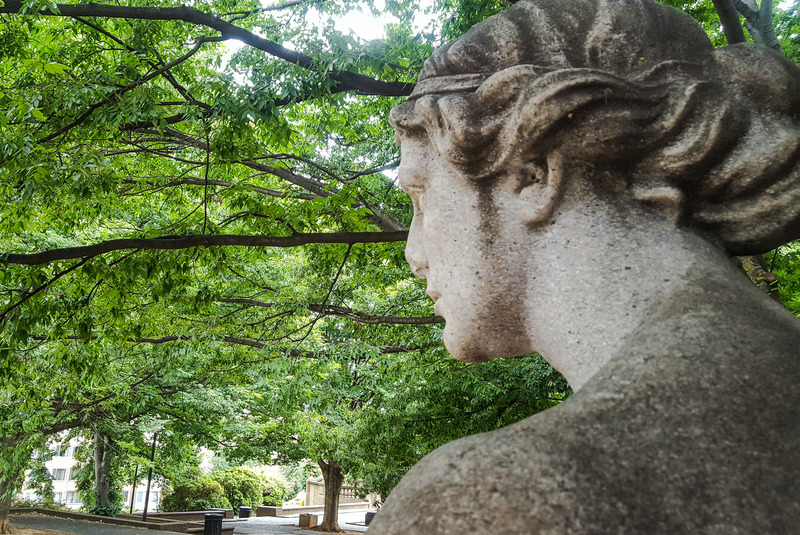 With the neighborhood gone, construction on Meridian Hill Park commenced in 1912. The elaborate park, designed in Italian Renaissance and French Baroque styles, took two decades to complete and wasn’t dedicated until 1936. 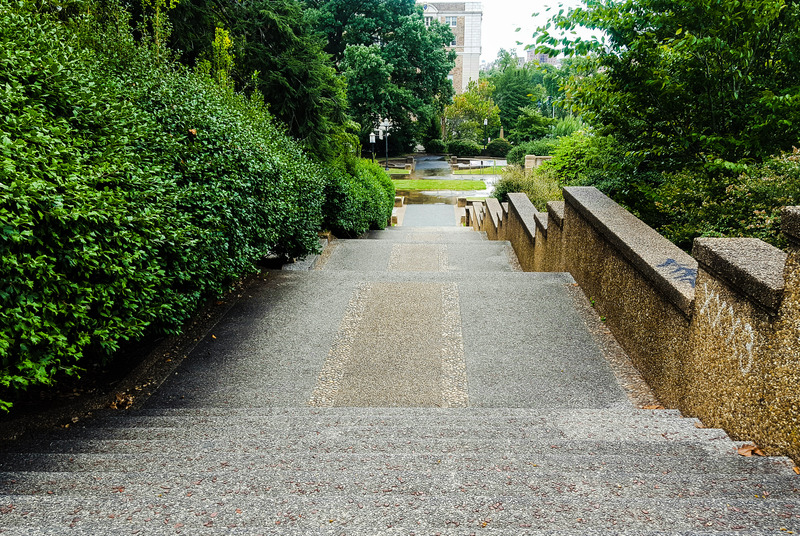 If you’re local, you may also know Meridian Hill Park by another name, Malcolm X Park. Back in 1969, activist (and fellow Brandeis alum!) Angela Davis called for the name change at a rally. Legislation was put forward to change the name, but it never passed. 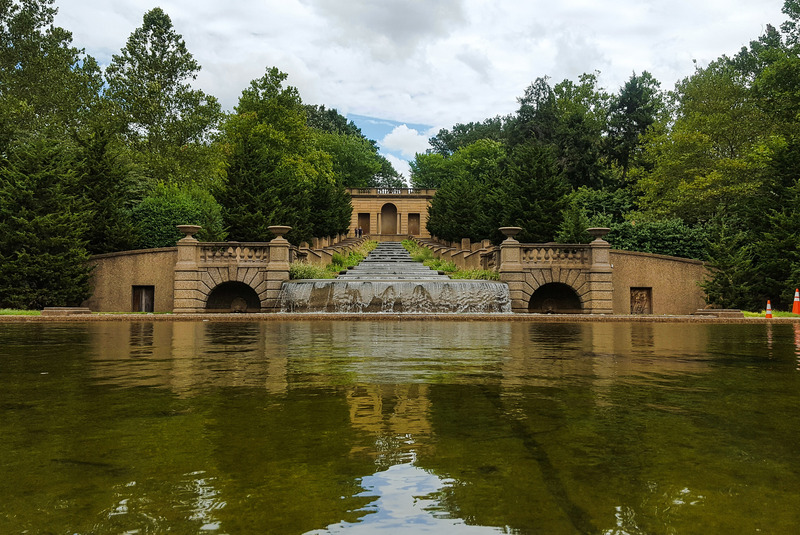 What’s in Meridian Hill Park? The most notable feature is the giant cascading fountain that serves as the centerpiece of the park. According to the National Park Service, the 13 basin fountain is the longest in North America. Regardless of any records it holds, when the fountain is on, it’s breathtaking. It doesn’t matter where you are – standing at the bottom, gazing over the top, perched on the side – there’s something about watched the water flow from basin to basin that’s captivating. For most of this summer, the fountain was off, and the water was stagnating and a little yucky. On my most recent visit to the park, however, I was lucky enough to see the fountain working. It was glorious. 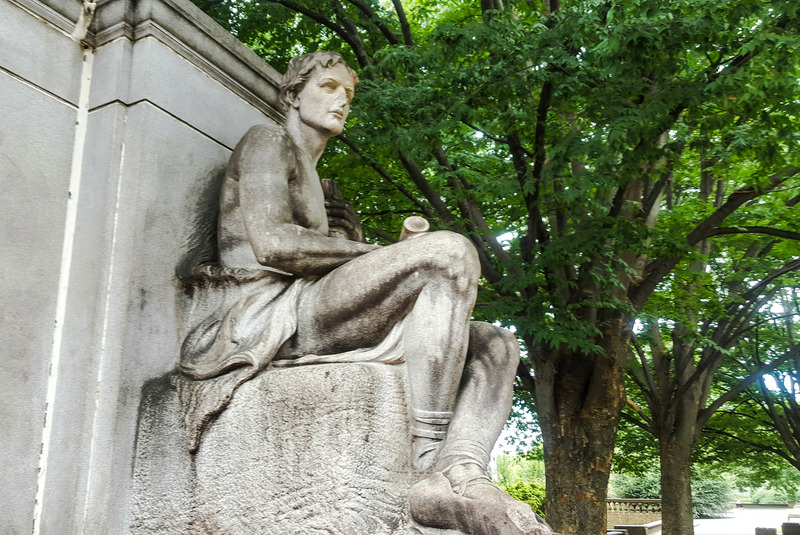 Meridian Hill Park is also home to some unusual statues and memorials, including one to President James Buchanan. James Buchanan has the unfortunate distinction of being remembered as our worst president. Perhaps, for that reason, it’s fitting that his memorial is tucked away in a place where it’s forgotten by all but the residents of this nation’s wonkiest city. The statue, which was completed in 1930, is pretty depressing looking. Buchanan is depicted as looking into his lap. It makes him seem like he’s down on his luck. It’s almost like he knows he has a terrible legacy. The statue of Joan of Arc is a sharp contrast to our 15th president. She sits proudly astride her horse, her sword raised, and she looks like she’s about to lead French forces into battle. 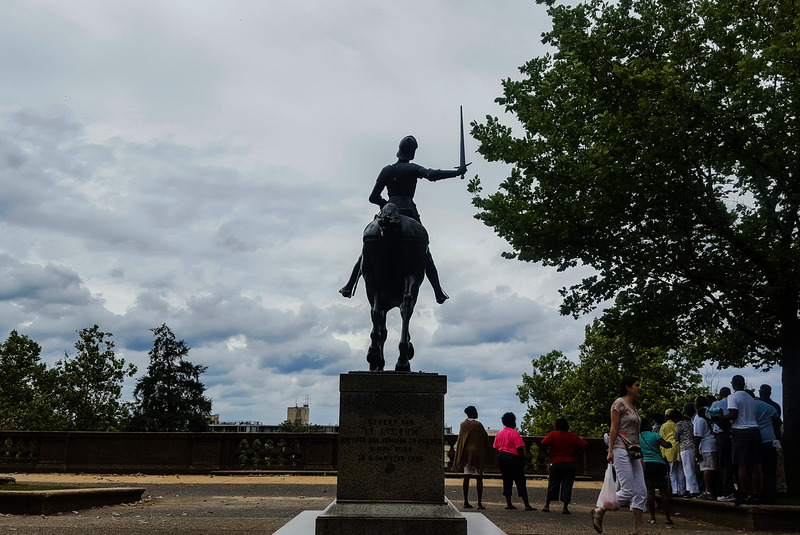 The centerpiece of the mall portion of the park, Joan of Arc is DC’s only equestrian statue of a woman. Completed in 1922 in Paris, the statue represents the friendship between the U.S. and France, and has been regarded as the finest equestrian statue of modern times. In 1978, Joan of Arc’s sword was stolen. She remained without her sword until 2011 when it was finally replaced. One week after I visited Joan and took these photos, her sword was, sadly, stolen again. As of this writing, it’s still missing. Tucked away on one of the park’s tiers is Dante Alighieri. 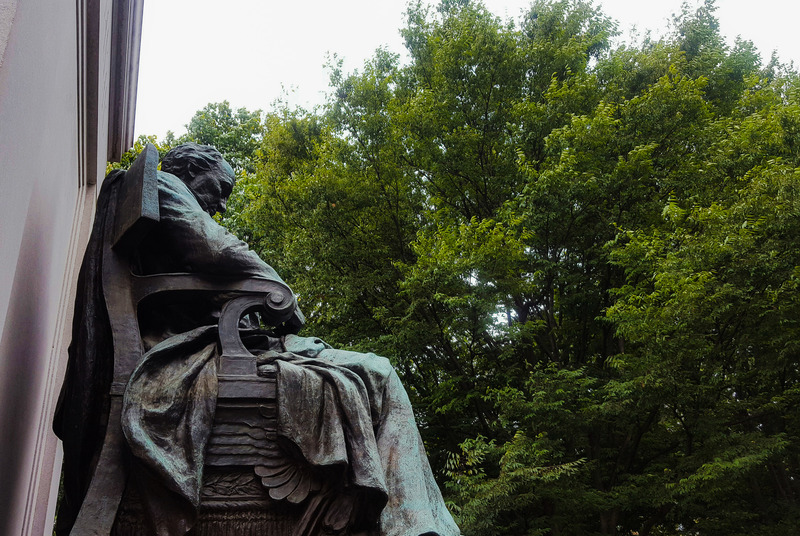 The statue is a tribute to poet Dante Alighieri and is a casting of another statue located in New York City. Carlo Barsotti, an Italian-American newspaper and bank owner, donated it as a gift of the Italians to the United States. Finally, there’s Serenity. Just like the James Buchanan Memorial, the Serenity statue makes me sad. Completed in 1925 to honor Navy officer William Henry Schuetze, Serenity is in terrible condition. Her left hand has broken off, her nose is gone, and her face is partially eroded. From her perch overlooking the traffic on 16th street, she doesn’t seem particularly serene. She doesn’t even look like a statue that was sculpted within the last 100 years. For nearly a century, Meridian Hill Park has been a site for protests, drum circles, snowball fights, and people watching. It’s survived the neighborhood’s hard times, and it’s been reborn as the area has improved. 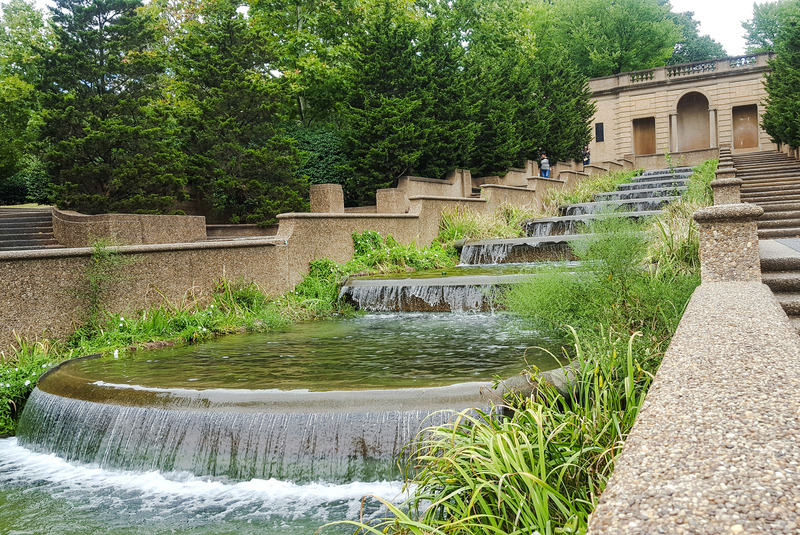 For me, when I need a moment away from everything, and I don’t have time to go out for a hike, Meridian Hill Park is one of my places. Stepping behind the walls of the park, the sounds of the city fade away. If weren’t for all the other people also using the park as a refuge, I would think it was my secret enclave. 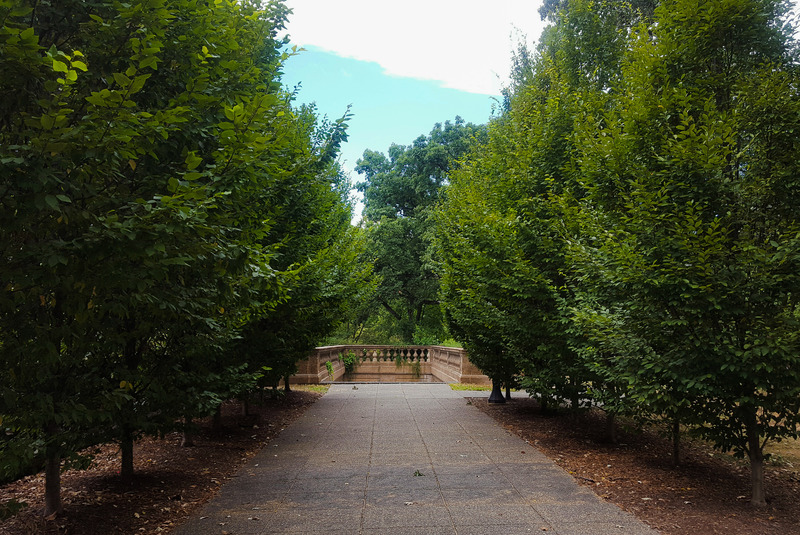 Meridian Hill Park is located at 2400 15th Street NW and is open during daylight hours. what a GREAT and fascinating blog post!!! nice write up!